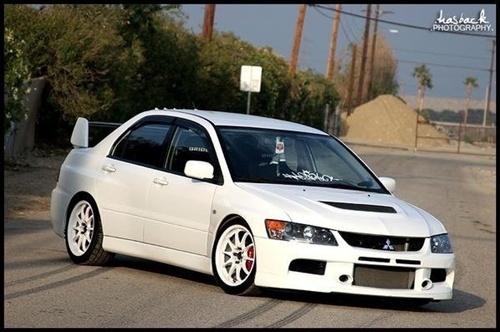 2003-2007 Mitsubishi Evo 8/9 4dr Z Speed Front Bumper. All Vis fiberglass Body Kits; bumpers, Lips side skirts, spoilers, and hoods are made out of a high quality fiberglass. All Body Kits come with wire mesh if applicable. Professional installation required. Picture shown is for illustration purpose only. Actual product may vary due to product enhancement. Modification of part is required to ensure proper fitment. Test fit all Body Kit parts before any modification or painting. Accessories like fog lights, driving lights, splitter, canards, add-on lip, intake scoops, or other enhancement products are not included unless specified in the product description. Intended for OFF ROAD use only. 2003-2007 Mitsubishi Evo 8/9 4dr OEM Front Bumper. All Vis fiberglass Body Kits; bumpers, Lips side skirts, spoilers, and hoods are made out of a high quality fiberglass. All Body Kits come with wire mesh if applicable. Professional installation required. Picture shown is for illustration purpose only. Actual product may vary due to product enhancement. Modification of part is required to ensure proper fitment. Test fit all Body Kit parts before any modification or painting. Accessories like fog lights, driving lights, splitter, canards, add-on lip, intake scoops, or other enhancement products are not included unless specified in the product description. Intended for OFF ROAD use only. 2003-2007 Mitsubishi Evo 8/9 4Dr Mr Front Bumper with SE Lip build-in. All Vis fiberglass Body Kits; bumpers, Lips side skirts, spoilers, and hoods are made out of a high quality fiberglass. All Body Kits come with wire mesh if applicable. Professional installation required. Picture shown is for illustration purpose only. Actual product may vary due to product enhancement. Modification of part is required to ensure proper fitment. Test fit all Body Kit parts before any modification or painting. Accessories like fog lights, driving lights, splitter, canards, add-on lip, intake scoops, or other enhancement products are not included unless specified in the product description. Intended for OFF ROAD use only. 2006-2007 Mitsubishi EVO 9 4dr MR Carbon Fiber Front Lip. ViS Carbon Fiber Hoods are made from the finest carbon fiber available. Each hood is protected with a UV coating which allows the hood to hold its high gloss finish. All our carbon fiber hoods are Grade A and above. ViS Carbon Fiber Hoods have a tight carbon weave, rolled edges, and one piece undersiding. Make sure when purchasing a ViS hood, look for the ViS Authenticity Badge.